In episode 191 of the podcast astrologers Kelly Surtees, Austin Coppock, and Chris Brennan present an overview of the major astrological alignments happening in February of 2019. 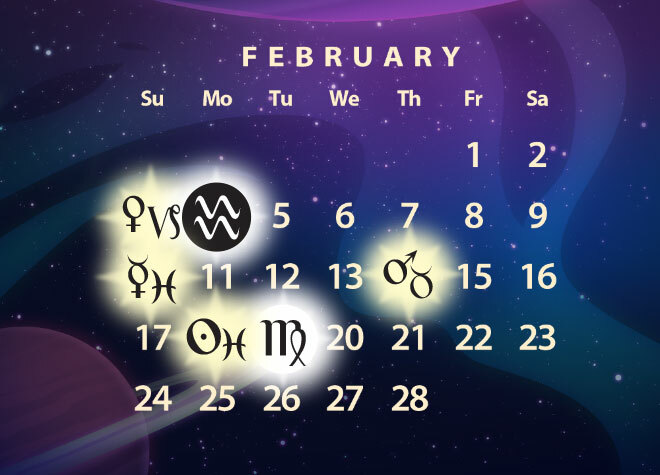 The astrology of February features Venus ingressing into Capricorn and conjoining Saturn and Pluto, Mars conjoining Uranus one last time in Aries before departing for Taurus, and Mercury making the first of three conjunctions with Neptune as it slows down and prepares to station retrograde. The episode opens with an hour-long chat where we touch on a few different topics such as the importance of astrological organizations in the community, tips for electional astrology, the gender disparity in the astrological community, and the confusion surrounding the animal totem for the zodiacal sign Cancer. This episode is available in both audio and video versions, and links to both are below. Our 2019 astrology calendar posters are now available on Amazon, with free 2-day shipping for Prime members. 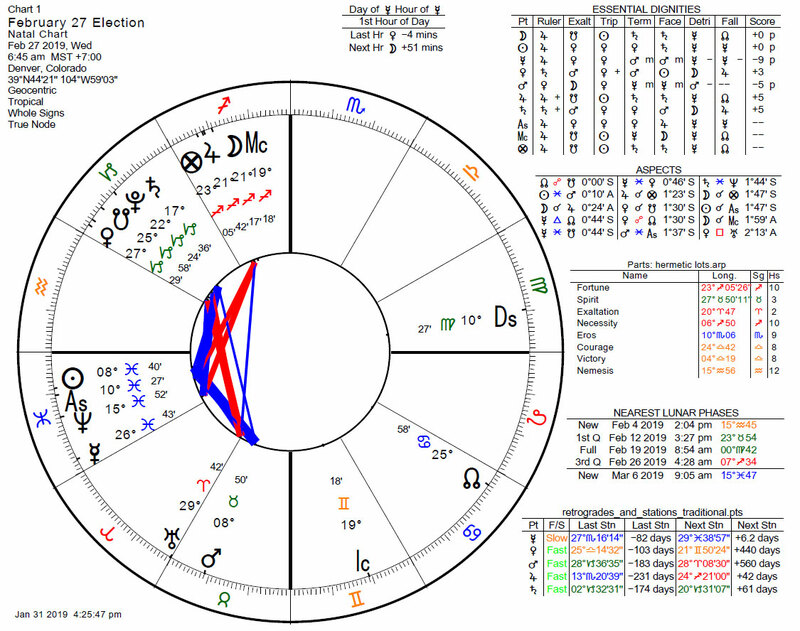 Chris and Leisa released a full 2019 electional astrology report, listing some of the luckiest dates to do things over the next 11 months. We are hosting a live podcast event on Thursday, May 23, 2019, starting at 8:30 PM at the Northwest Astrological Conference. Scholarships for the Northwest Astrological Conference are available. The Association for Astrological Networking will be announcing the availability of scholarships for conferences this year soon as well. The mods of /r/AskAstrologers on Reddit are looking for people to help read charts there. It is just a free gig, but good practice if you are an up-and-coming astrologer. Austin launched his podcast, Eavesdropping at Midnight, and the first episode with Tony Mack is available now. Chris is not releasing audio versions of his horoscopes this month, but you can find video versions of the horoscopes for February 2019 on Twitter. Mercury conjoins Neptune and enters Rx shadow Feb 19-ish. There are a few more electional charts that we found for February, which are available in our private subscriber-only podcast on auspicious elections that was released yesterday. The forecast portion of the show begins around 1 hour and 13 minutes into the episode. I like Venus moving into Cap as it trines the Yin Earth dignity for her (Taurus). As usual, the natal chart will be the determining factor as to whether or not this is a sweet temporary touch coming into contact with the serious and serious Saturn Pluto which is already a known. Also, Venus will be sextile to Neptune once she is conjoined to Saturn. That could be a very interesting trio. Something beautiful could take form perhaps. This is a boon to Saturn and its aspects it seems to me. I would rather see Cancer misrepresented as a lobster than looking like a bloated deer tick. I love the refreshing rigor of the debates initiated by Chris in these podcasts. In this episode particularly the ongoing conversation you’re having about gender, astrology and pejoratives. I am listening in another time zone (UK) from you guys and don’t have enough capacity to join any social media debates but I’m intrigued to know … how are you integrating (synthesising?) the Romantic and Modern discoveries of the outer planets (and their rulership assignments) with the (re)discovery of the Ancient and Classical theory and methods that the practice of astrology relies upon? Eg. discussion about gender in this episode missed out (amongst many things, for understandable reasons) the difference made by dependable Modern birth control technology for women interested in practicing any profession. Apologies if my question is too dense to make sense of here, and for nudging on this topic again, Chris. My Libra Asc. and detriment Venus R square dignified Saturn seeks to establish some harmonisation in a debate about Ancient and Modern practices that seems to have become polarised. Dialectics helpfully further any philosophy when protagonist and antagonist synthesise. Not a common practice evident in UK political philosophy just now – or perhaps ever! I see going through the “meat grinder” as something painfully positive. Transmuting an untenable situation in the measure needed to create the change. Last night, I dreamt I was being eaten by a crocodile, the living meat grinder. I don’t want to foolishly say “bring it on!” but I will say that I will do my best to accept whatever it approaching and am looking forward to what is on the other side. Brilliant, thank you… I’ll be charging all my batteries on the 27th!! Today is Feb 2 and Pluto is making the 21 degree partile square to Mars. I am reminded that this is the unfolding of the full blossom and the waning square will bring results. As an individual in a Mars profected year with a natal Mars at 20 degrees Cap under the thumb of this Pluto and Saturn applying, I am not wallowing over this today – it is not a watery situation here. Mars is running very hot and is very sword ready right now – as in, absolute determination to conquer the seemingly insurmountable forces holding it back despite intense frustration. The frustration is there but gets tabled and given over to ACTION. Mars instinctively knows to fight what it can and to quickly move away from what is too much of a force, too dependent on others. In other words, it needs a good fight and a good win right now and will find one. This is a good use of this Mars – screw Pluto and his agenda for now. This is the reconciliation of the square – let it be there and work around it. Get something else done, conquer something else. Psychedelic mudslide!! Curious why Chiron’s ingress into Aries didn’t get any love?